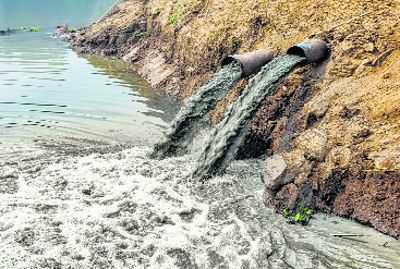 Justice Pritam Pal (retd)-led executive committee, mandated to monitor the pollution level in the Ghaggar, has raided seven water-polluting industries in industrial areas of Panchkula and Chandigarh and found their treatment plants non-functional. The raids at two places in Chandigarh were conducted on Friday and at five places in Panchkula on Saturday. None of the local officials was taken along. The treatment plants at all industries were found non-operational. The discharge from these industries goes into drains and ultimately into the Ghaggar. After the submission of the executive committee’s report tomorrow, action will be taken against the industries, which could include fine, sealing or even snapping the power and water supply connections. The National Green Tribunal (NGT), on August 7, 2018, had appointed Justice Pritam Pal, a former Haryana Lokayukta, as the chairman of the executive committee. The National Human Rights Commission had taken suo motu notice of a news item published in The Tribune on May 12, 2014, “Stench grips Mansa’s sacred Ghaggar river”. The Ghaggar had turned into a polluted water body on account of discharge of effluents, industrial as well as municipal. On the reference of the NHRC, the NGT took over the case in 2016. “During the raids in Chandigarh and Panchkula, it was found that pollution control board officials of both Chandigarh and Haryana were not checking water pollution. They appear to be hand in glove with the polluting industries. It is dereliction of duty,” said Justice Pritam Pal. The water-polluting industries which were raided in Chandigarh and Panchkula related to electroplating. Besides carrying out surprise checks, Justice Pritam Pal also visited the Sukhna choe and the N choe on Saturday. It was found that sources of water pollution were plugged in the Sukhna choe but at the N choe, water appeared brackish. It was ordered that water samples would be taken from the N choe and the report would be submitted to the executive committee. Both the Sukhna choe and the N choe merge with the Ghaggar.